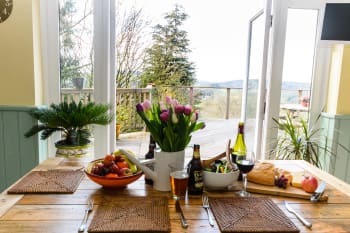 Perched high in the Royal Forest of Dean with breath-taking views across the Wye Valley & Brecon Beacons, an intimate and delightful Cottage for up to 6 people and their dogs. Most rooms open to a huge decking with integrated Hot Tub & Sauna! 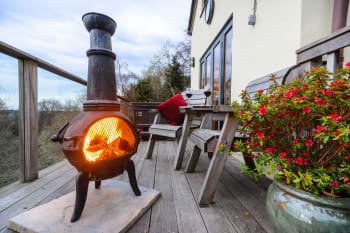 Built in the 1850's and retaining much of it’s Cottage charm, The Reddings has been extended on 5 levels with most rooms open to the decking for you to enjoy the hot tub or for al fresco dining whilst you enjoy the amazing views. 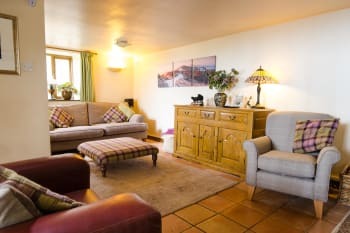 Throughout, you will find comfortable, quality furnishings & décor reflecting the rustic nature of the Cottage and it's surroundings; you will also find a good range of facilities and extra touches - all designed to make you feel welcome and at home. 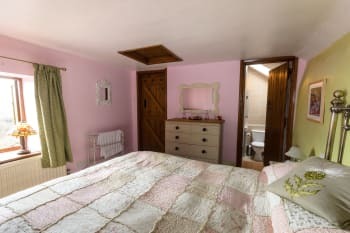 Three bedrooms, the first with a kingsize bed and en-suite shower & toilet; the 2nd bedroom has a double bed; the 3rd room has ‘adult size’ bunk beds. Toiletries, towels & bed linen provided. 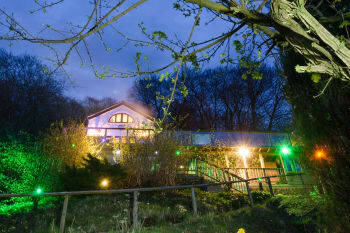 There are no rooms available at Wye Valley Forest Retreat for these dates. Just loads to do We enjoyed dean forest railway, the snowman at Cheltenham town hall and boat ride with Santa at Gloucester docks! Lovely house hot tub and sauna, very comfortable and well equipped. Large supermarkets in Ross on Wye for shopping, lots of local pubs in area. A beautiful, well equipped, large house in an idyllic location. The views are absolutely stunning. 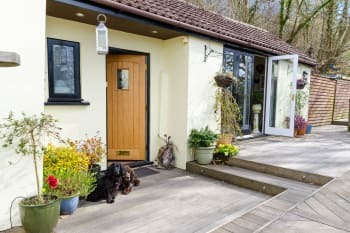 The owners were very helpful and we felt we were staying as guests in their home as opposed to just renting a holiday property. We would recommend The Hostelrie inn at Goodrich (dogs welcome). 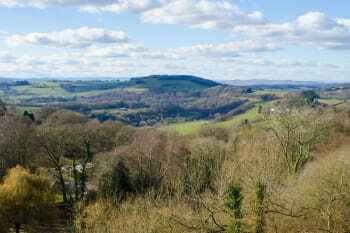 Good cycling and walking nearby in The Forest of Dean. Just returned from a wonderful 4 night break with my family and our dog. 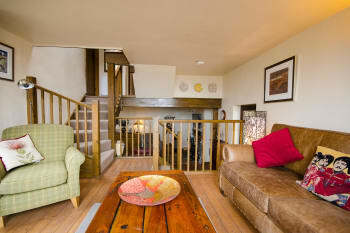 The cottage is fantastic, cozy and has everything you need for a short stay. 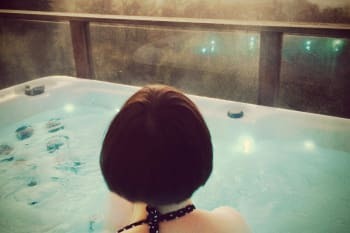 The view is amazing, its hard to stop yourself sitting outside to relax or enjoy the view from the hot tub! There is plenty of space to relax, the bedrooms are very comfortable and has a well equipped kitchen. 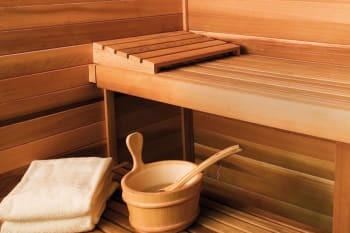 For extra relaxation there is also a sauna. Phill and Jayne are a lovely couple and keep in touch. I would definitely recommend a stay here, great location for exploring the Forest of Dean. Canoeing down the River Wye is lovely. A visit to Mallards Pike Lake is lovely, nice walk and a great place for a picnic. The Sculpture trail is great to visit. Absolutely beautiful, stayed here for my boyfriends birthday. There were 6 of us and we all loved it! The house is beautiful- the photos are lovely and even they don't do it justice, you have to see for yourself - and the views are phenomenal. The decking area is very large! Would be even better in the summer. The sauna WOW, didnt want to get out. All in all it was beautiful. Will definitely be returning! Jayne and Phil were amazing too, quick at emailing back and answering any questions i had! Jayne also texted me during the weekend to check we were having a nice time. Very nice people. Wow! That is the only word I can think of to summarise our stay. Beautiful home, amazing views, great location. Everything you need is provided. Jayne and Phill communicated regularly and they provided plenty of information for our stay. I will most definitely book again and will recommend to friends without hesitation. If walking to the local pubs in the evening then take torches. The roads from the cottage have no paths or lighting so can be very dangerous but with common sense and care there should be no problems. We loved our stay here and would recommend a stay to others. The setting is beautiful, even in October. We would love to return. There are lots of lovely walks around the forest. A beautiful lodge set in lovely grounds. We were made to feel most welcome with tea, coffee, juice and a delicious cake. Our dogs loved the grounds and immediately felt at home. We would definitely love to stay again on our next visit to the forest. Very central position for great walks. 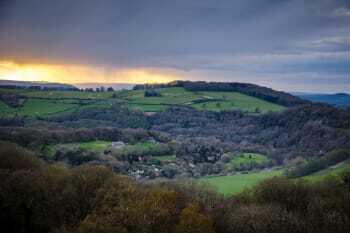 Close to Ross on Wye for shopping and canoeing and Symonds Yat for incredible views and the Falcons. The hot tub and sauna await you after a day's walking around the beautiful forest. Just returned from a long weekend stay at this property and I can only sing its praises. 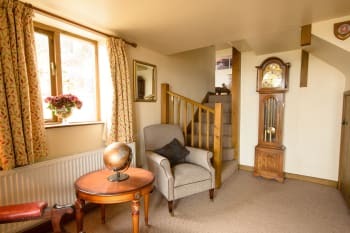 The accommodation is beautiful and homely, excellent standard of facilities including the sauna and hot tub which a welcome sight after walking along Symonds Yat during the day. The accommodation is exactly as shown in the photos (if not better!). The owners were great - accessible easily by telephone if needed, and provided a really helpful welcome info pack. The property has fantastic views over the valley and has a great secure garden for children. You won't be disappointed. We will certainly be returning. 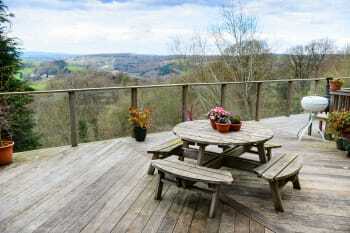 Brilliantly located for Ross on Wye and Symonds Yat. An outdoor pursuits centre is about 10mins down the road catering for water and climbing sports.